I came across this photo challenge at rather an apt time. This week’s theme of ‘blue’ struck a chord. I appear to have ‘lost my mojo’ and am looking to ‘get my groove back’. This doesn’t happen often – usually I’m the one helping others stay upbeat no matter what’s thrown at them. I can’t even say a lot has been thrown at me – nothing life or lifestyle threatening – just a bit of temporary uncertainty. This entry was posted in Fine Art Photography, Macro Photography, Photography and tagged blue, flora, flowers, Forget-Me-Nots, macro, moods, photo challenge, postaday. Bookmark the permalink. Thanks Ailsa. There’s a beautiful historical garden in Calgary that’s wonderful in early summer. That’s where these beauties were found. Thanks Myra – mojo slowly returning! A good night’s sleep definitely helps! Thanks Inge – I was impressed with your use of a magnifying glass! Oh, wow – this is beautiful! Thanks for swinging in to check it out! Thanks Imelda. One of my favourites. I understand about your “temporary uncertainty.” Nice shot of the forget-me-nots. That blue is almost piercing! Thank you for visiting my blog and your blue flowers are just stunning! That is a pretty pretty blue!! 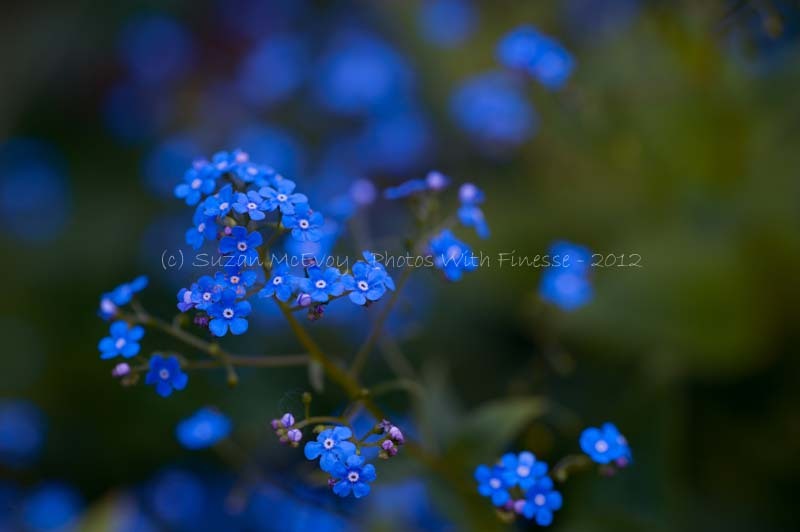 Tiny little inspirations… just to “Forget Me Not”… love the picture!! beautiful blue!!! photo-therapy is the absolute best! (well… that and shoe-shopping… heehee). Retail therapy is always good!